Raumfahrt+Astronomie-Blog von CENAP - Blog: Astronomie - Untergrund-Ozean auf dem größten Mond des Jupiters, Ganymed. NASA’s Hubble Space Telescope has the best evidence yet for an underground saltwater ocean on Ganymede, Jupiter’s largest moon. The subterranean ocean is thought to have more water than all the water on Earth's surface. "I was always brainstorming how we could use a telescope in other ways," said Saur. "Is there a way you could use a telescope to look inside a planetary body? Then I thought, the aurorae! Because aurorae are controlled by the magnetic field, if you observe the aurorae in an appropriate way, you learn something about the magnetic field. If you know the magnetic field, then you know something about the moon’s interior." If a saltwater ocean were present, Jupiter’s magnetic field would create a secondary magnetic field in the ocean that would counter Jupiter’s field. This “magnetic friction” would suppress the rocking of the aurorae. This ocean fights Jupiter's magnetic field so strongly that it reduces the rocking of the aurorae to 2 degrees, instead of the 6 degrees, if the ocean was not present. 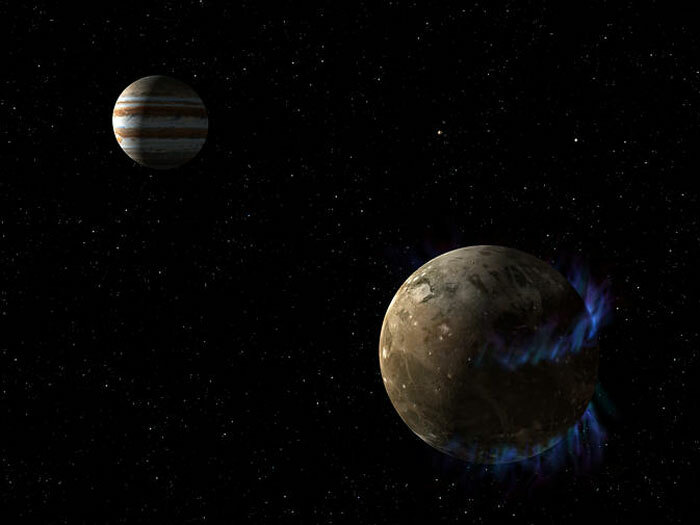 Scientists first suspected an ocean in Ganymede in the 1970s, based on models of the large moon. 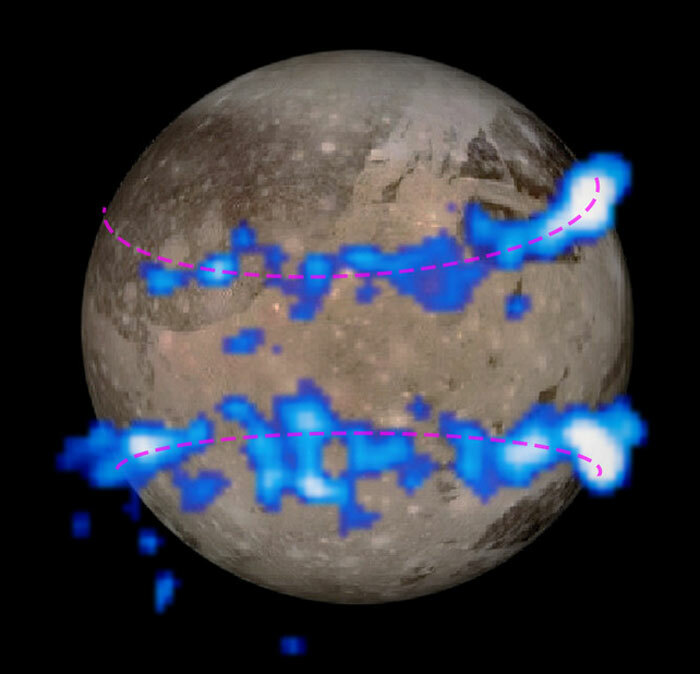 NASA's Galileo mission measured Ganymede's magnetic field in 2002, providing the first evidence supporting those suspicions. The Galileo spacecraft took brief "snapshot" measurements of the magnetic field in 20-minute intervals, but its observations were too brief to distinctly catch the cyclical rocking of the ocean’s secondary magnetic field. NASA’s Hubble Space Telescope is celebrating 25 years of groundbreaking science on April 24. It has transformed our understanding of our solar system and beyond, and helped us find our place among the stars. To join the conversation about 25 years of Hubble discoveries, use the hashtag #Hubble25. Hubble is a project of international cooperation between NASA and ESA (European Space Agency). NASA's Goddard Space Flight Center in Greenbelt, Maryland, manages the telescope. The Space Telescope Science Institute (STScI) in Baltimore, Maryland, conducts Hubble science operations. STScI is operated for NASA by the Association of Universities for Research in Astronomy, Inc., in Washington.